Today I have something special to share with you all-a little lifestyle extra. I recently joined Influenster and was sent a VoxBox to review. Influenster is a free-to-join community of people who give their opinions on products. Influenster invites members to participate in VoxBox programs where they offer complimentary products for review. Select members are chosen to receive FREE themed boxes based on Expert badges they have unlocked, their overall Influenster score, and demographics. The more active you are on the site(connecting to your social networks helps), the more surveys you fill out, and badges you earn-the higher your score. Members with high scores are more likely to be chosen, but you are not guaranteed a box. But having a high Influenster and Expert scores, active profile, and good performance on past programs may benefit you. 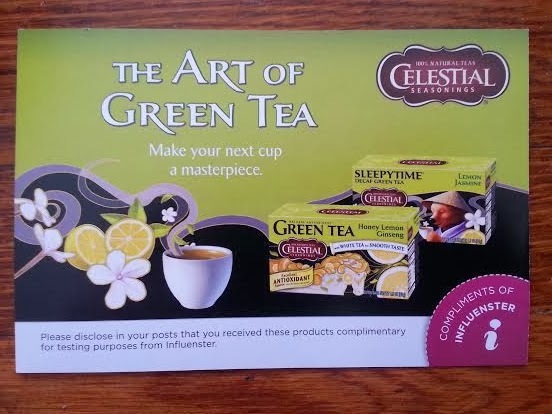 Shortly after I joined Influenster, they sent me a complimentary Celestial Seasonings box which I am finally getting around to sharing with you all (better late than never)! 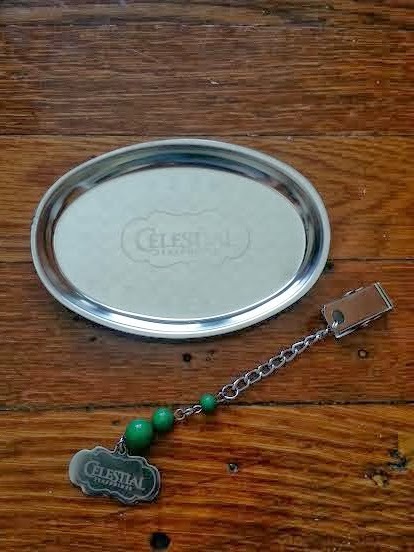 I love tea and Celestial Seasonings is my go to brand for tea, so I was psyched that Influenster sent me a themed box consisting of Celestial Seasoning teas and accessories! Green tea is a great addition to a healthy diet. Celestial Seasonings' green tea contains Antioxidants Vitamin C, so you'll get 20% of your recommended daily Vitamin C in every cup! Flavonoid Antioxidants are included to counter the harmful effects of free radicals in your body. Plus their tea contains less Caffeine than a cup of coffee, and decaf is also available. Sample Size (2 Tea Bags)-$0.27 Value! The tea bag smells like spearmint! However, once brewed, the main ingredients take over and you don't really taste the spearmint. 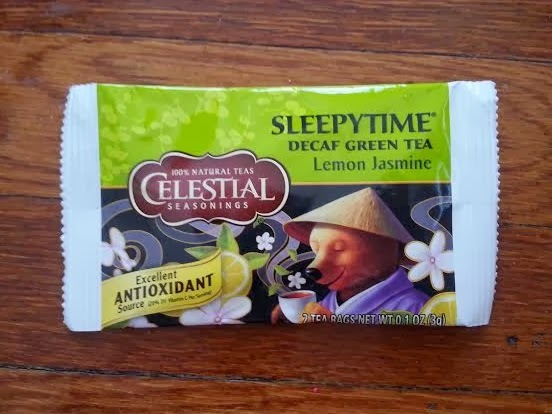 This was a great tasting tea- perfect to drink before bedtime. Sample Size (2 Tea Bags)-0.27 Value! I just loved the smell of this tea. I can't quite explain how the tea bag smelled before brewing other than saying it kind of reminds me of the beef seasoning from ramen noodles. That doesn't sound very natural, so I don't know. Maybe it's just me, but I really liked it! Haha. If anyone knows which ingredient I am noticing and can better describe it, please leave me a comment down below! I also really loved the smell of the tea bag after brewing-you can really smell the lemon and I just could not get enough! I was ecstatic that this coupon was included. It's awesome that I could pick out another flavor to try! Full Size (20 Tea Bags)-$2.69 Value! I went to my local Wegmans to redeem my coupon for this box. 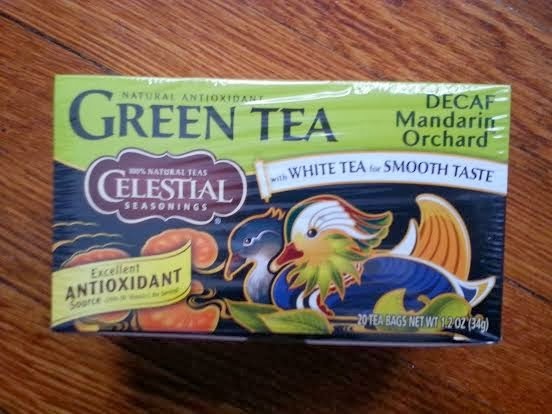 While Celestial Seasonings offers this box for $3.19 on their website, I based its value on the pricing at Wegmans since that is where I typically buy my tea. Depending on where you shop, the pricing may vary. 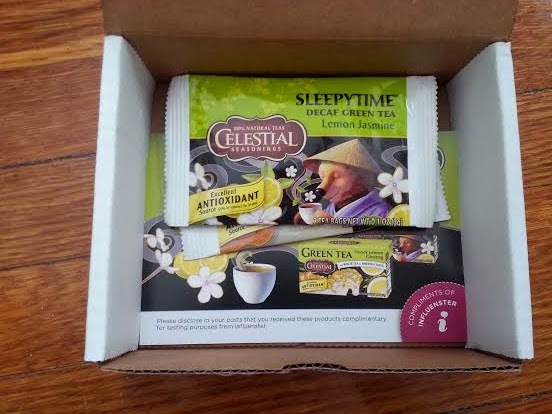 I was pleasantly surprised when a second box arrived from Influenster containing some tea accessories! This caddie is just too cute with the Celestial Seasonings logo on it! It's perfect to hold my tea bags. 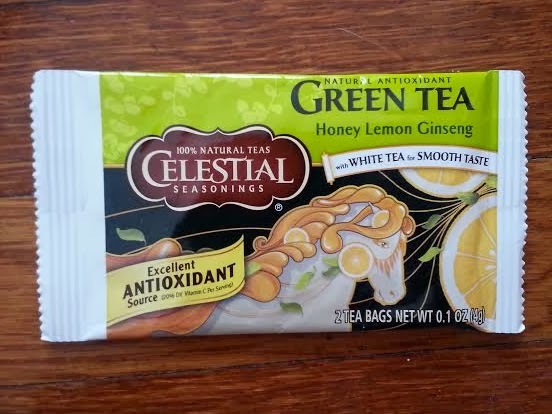 When I was first introduced to Celestial Seasonings I thought it odd that their tea bags come without strings attached since so many companies include strings on their tea bags for ease of use. 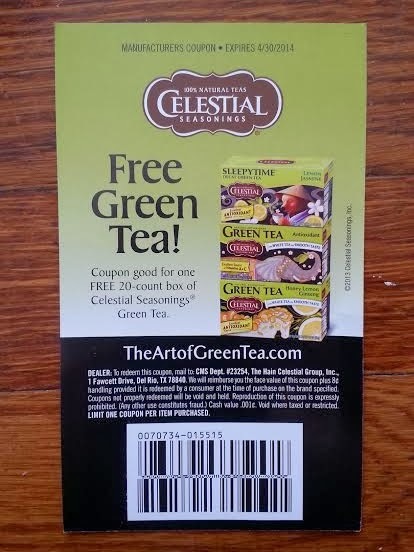 But I had learned that because Celestial Seasonings doesn't have strings, tags, staple, or individual wrappers on their tea bags they save on waste, making it better for the environment. 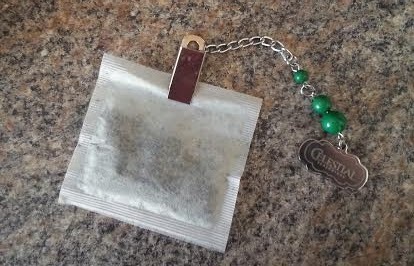 This tea bag clip is so useful because it attaches to the tea bag, so you don't have to fish in your mug for the bag when the tea is done seeping! I just loved this box so much! I drank each tea as I always do-plain without sugar, milk, honey, or lemon. I enjoyed all three tea-all of them had a nice flavor and none of them were bitter. And I am very happy to have some keepsakes to use with my future tea purchases! Have you ever received an Influenster VoxBox? If you'd like to join Influenster, you can sign up here! Disclaimer: I received this box complimentary from Influenster in exchange for my opinions on the products in the box. No compensation was received. All opinions are my own.